In this tutorial, we will continue exploring the fascinating world of Excel Conditional Formatting. If you do not feel very comfortable in this area, you may want to look through the previous article first to revive the basics - How to use conditional formatting in Excel 2016 and 2013. Today are going to dwell on how to use Excel formulas to format individual cells and entire rows based on the values you specify or based on another cell's value. This is often considered advanced aerobatics of Excel conditional formatting and once mastered, it will help you push the formats in your spreadsheets far beyond their common uses. Excel's pre-defined conditional formatting rules are mainly purposed to format cells based on their own values or the values you specify. I am talking about Data Bars, Color Scales, Icon Sets and other rules available to you on the Conditional Formatting button click. If you want to apply conditional formatting based on another cell or format the entire row based on a single cell's value, then you will need to use Excel formulas. So, let's see how you can make a rule using a formula and after that I will provide a number of formula examples for different tasks. As you remember, in all modern versions of Excel 2016, Excel 2013, and Excel 2010, the conditional formatting feature resides on the Home tab > Styles group. In Excel 2003, you can find it under the Format menu. Select the cells you want to format. You can select one column, several columns or the entire table if you want to apply your conditional format to rows. Convert a range of cells to a table (Insert tab > Table). 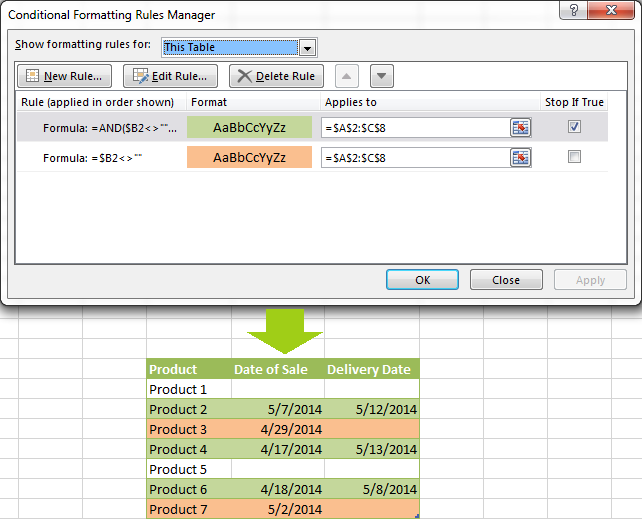 In this case, the conditional formatting will be automatically applied to all new rows. Select some empty rows below your data, say 100 blank rows. 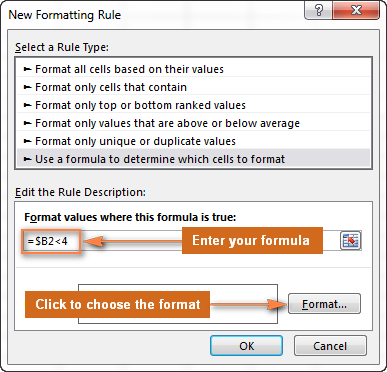 In the New Formatting Rule window, select Use a formula to determine which cells to format. Enter the formula in the corresponding box. Click the Format… button to choose your custom format. Switch between the Font, Border and Fill tabs and play with different options such as font style, pattern color and fill effects to set up the format that works best for you. If the standard palette does not suffice, click More colors… and choose any RGB or HSL color to your liking. When done, click the OK button. Make sure the Preview section displays the format you want and if it does, click the OK button to save the rule. If you are not quite happy with the format preview, click the Format… button again and make the edits. Tip. Whenever you need to edit a conditional formatting formula, press F2 and then move to the needed place within the formula using the arrow keys. If you try arrowing without pressing F2, a range will be inserted into the formula rather than just moving the insertion pointer. To add a certain cell reference to the formula, press F2 a second time and then click that cell. Tip. 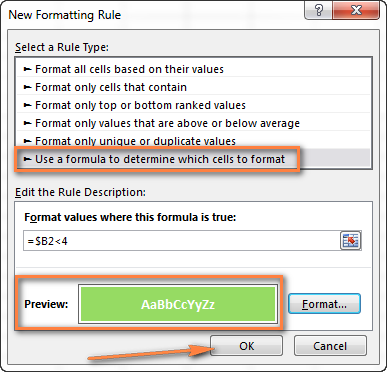 For your Excel conditional formatting formula to work correctly, please always follow these simple rules. The screenshot below shows an example of the Greater than formula that highlights product names in column A if the number of items in stock (column C) is greater than 0. Please pay attention that the formula applies to column A only ($A$2:$A$8). But if you select the whole table (in our case, $A$2:$E$8), this will highlight entire rows based on the value in column C.
=$A2<$B2 - format cells or rows if a value in column A is less than the corresponding value in column B. =$A2=$B2 - format cells or rows if values in columns A and B are the same. =$A2<>$B2 - format cells or rows if a value in column A is not the same as in column B. As you can see in the screenshot below, these formulas work for text values as well as for numbers. If both conditions are met =AND($B2<$C2, $C2<$D2) Formats cells if the value in column B is less than in column C, and if the value in column C is less than in column D.
If one of the conditions is met =OR($B2<$C2, $C2<$D2) Formats cells if the value in column B is less than in column C, or if the value in column C is less than in column D.
In the screenshot below, we use the formula =AND($C2>0, $D2="Worldwide") to change the background color of rows if the number of items in stock (Column C) is greater than 0 and if the product ships worldwide (Column D). Please pay attention that the formula works with text values as well as with numbers. Naturally, you can use two, three or more conditions in your =AND and =OR formulas. These are the basic conditional formatting formulas you use in Excel. Now let's consider a bit more complex but far more interesting examples. I think everyone knows how to format empty and not empty cells in Excel - you simply create a new rule of the "Format only cells that contain" type and choose either Blanks or No Blanks. Formula for blanks: =$B2="" - format selected cells / rows if a corresponding cell in Column B is blank. Formula for non-blanks: =$B2<>"" - format selected cells / rows if a corresponding cell in Column B is not blank. Note. The formulas above will work for cells that are "visually" empty or not empty. If you use some Excel function that returns an empty string, e.g. =if(false,"OK", ""), and you don't want such cells to be treated as blanks, use the following formulas instead =isblank(A1)=true or =isblank(A1)=false to format blank and non-blank cells, respectively. Orange rows (a cell in column B is not empty): =$B2<>""
In this particular case, the "Stop if true" option is actually superfluous, and the rule will work with or without it. You may want to check this box just as an extra precaution, in case you add a few other rules in the future that may conflict with any of the existing ones. If you want to apply conditional formatting to selected columns when another cell in the same row contains a certain word, you can use a simple formula like =$D2="Worldwide" (we've used a similar formula in one of the previous examples). However, this formula will work for exact match only. =SEARCH("Worldwide", $D2)>0 - format selected cells or rows if a corresponding cell in column D contains the word "Worldwide". 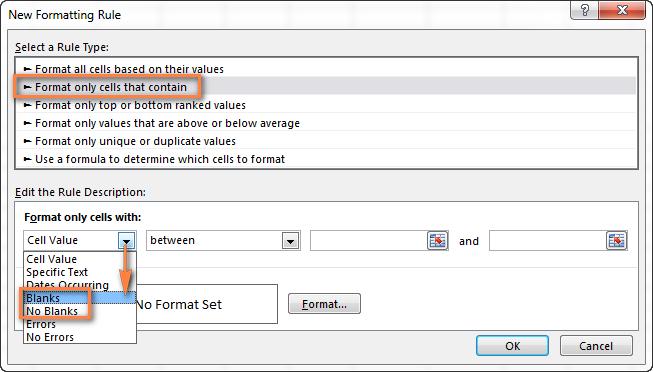 This formula will find all such cells, regardless of where the search text is located in a cell, e.g. "Ships Worldwide", "Worldwide, except for…" etc. =SEARCH("Worldwide", $D2)>1 - shade selected cells or rows if the cell's content starts with the search text. 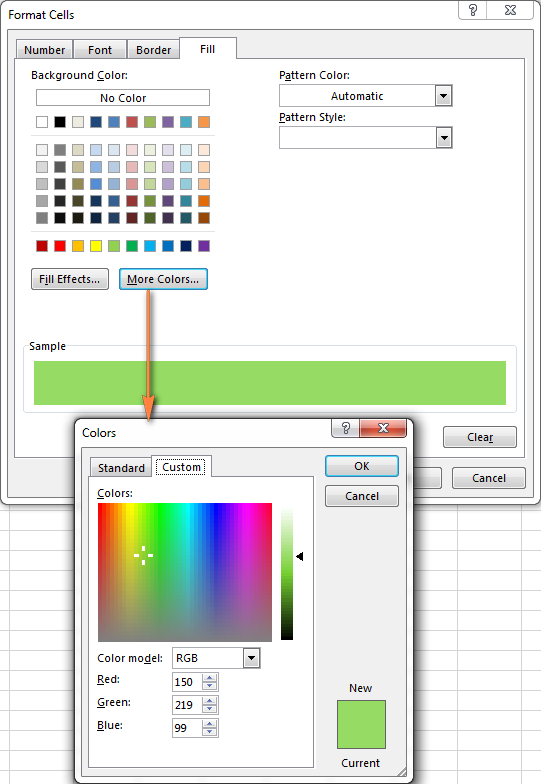 If your task is to conditionally format cells with duplicate values, you can go with the pre-defined rule available under Conditional formatting > Highlight Cells Rules > Duplicate Values… The following article provides a detailed guidance on how to use this feature: How to automatically highlight duplicates in Excel. However, in some cases the data looks better if you color selected columns or entire rows when a duplicate values occurs in another column. In this case, you will need to employ an Excel conditional formatting formula again, and this time we will be using the COUNTIF formula. As you know, this Excel function counts the number of cells within a specified range that meet a single criterion. =COUNTIF($A$2:$A$10,$A2)>1 - this formula finds duplicate values in the specified range in Column A (A2:A10 in our case), including first occurrences. If you'd rather highlight only duplicates on consecutive rows, you can do this in the following way. This method works for any data types: numbers, text values and dates. Select the column where you want to highlight duplicates, without the column header. Rule 1 (blue): =$A1=$A2 - highlights the 2nd occurrence and all subsequent occurrences, if any. 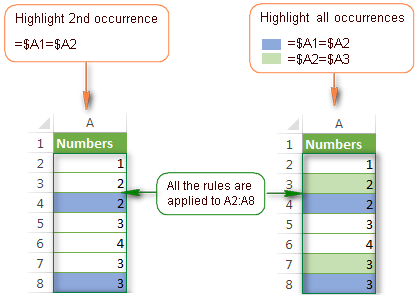 Rule 2 (green): =$A2=$A3 - highlights the 1st occurrence. In the above formulas, A is the column you want to check for dupes, $A1 is the column header, $A2 is the first cell with data. Important! 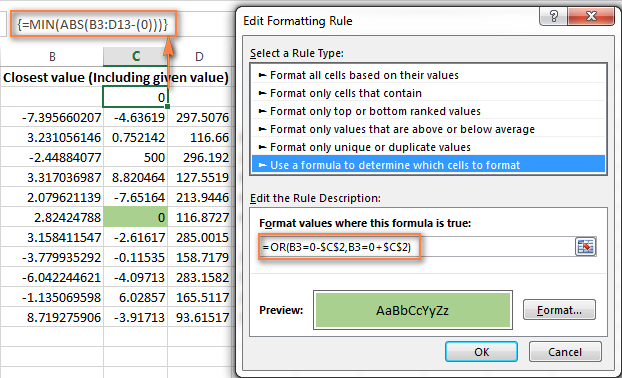 For the formulas to work correctly, it is essential that Rule 1, which highlights the 2nd and all subsequent duplicate occurrences, should be the first rule in the list, especially if you are using two different colors. If you want apply the conditional format when duplicate values occur in two or more columns, you will need to add an extra column to your table in which you concatenate the values from the key columns using a simple formula like this one =A2&B2. After that you apply a rule using either variation of the COUNTIF formula for duplicates (with or without 1st occurrences). Naturally, you can hide an additional column after creating the rule. Alternatively, you can use the COUNTIFS function that supports multiple criteria in a single formula. In this case, you won't need a helper column. Note. For such conditional formulas to work correctly, it's very important that you apply the rules to the entire columns, e.g. =$A:$A and =$B:$B. You can see an example of practical usage in the following screenshot that highlights duplicates in Columns E and F.
As you can see, Excel conditional formatting formulas cope with dupes pretty well. However, for more complex cases, I would recommend using the Duplicate Remover add-in that is especially designed to find, highlight and remove duplicates in Excel, in one sheet or between two spreadsheets. When you work with several sets of numeric data, the AVERAGE() function may come in handy to format cells whose values are below or above the average in a column. 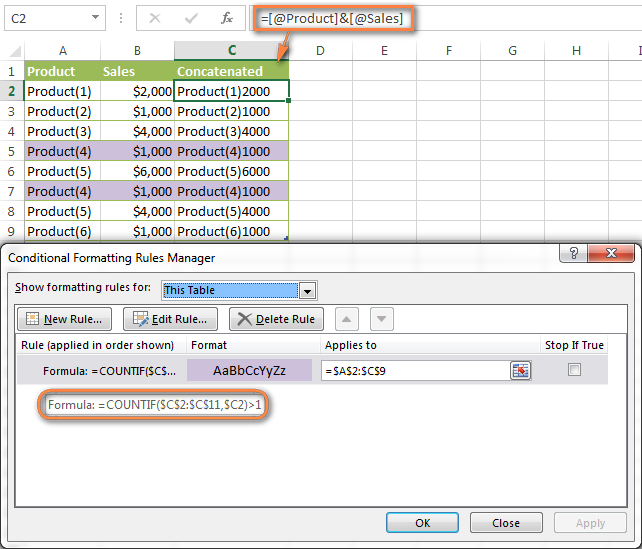 For example, you can use the formula =$E2<AVERAGE($E$2:$E$8) to conditionally format the rows where the sale numbers are below the average, as shown in the screenshot below. If you are looking for the opposite, i.e. to shade the products performing above the average, replace "<" with ">" in the formula: =$E2>AVERAGE($E$2:$E$8). In our example, we'll find and highlight the number that is closest to zero. If the data set contains one or more zeroes, all of them will be highlighted. If there is no 0, then the value closest to it, either positive or negative, will be highlighted. Note. This is an array formula, so you need to press Ctrl + Shift + Enter instead of a simple Enter stroke to complete it. In case you do not want to highlight the exact match, you need a different array formula that will find the closest value but ignore the exact match. Please remember to press Ctrl + Shift + Enter after you finished typing your array formula. 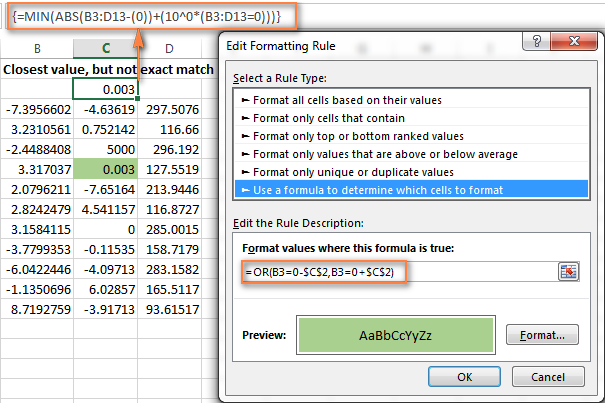 However, since our array formula in cell C2 ignores the exact match, the conditional formatting rule ignores zeroes too and highlights the value 0.003 that is the closest match. If you want to find the value nearest to some other number in your Excel sheet, just replace "0" with the number you want both in the array and conditional formatting formulas. Why isn't my Excel conditional formatting working correctly? Use absolute & relative cell addresses correctly. It's very difficult to deduce a general rule that will work in 100 per cent of cases. But most often you would use an absolute column (with $) and relative row (without $) in your cell references, e.g. =$A1>1. Please keep in mind that the formulas =A1=1, =$A$1=1 and =A$1=1 will produce different results. If you are not sure which one is correct in your case, you can try all : ) For more information, please see Relative and absolute cell references in Excel conditional formatting. Verify the applied range. Check whether your conditional formatting rule applies to the correct range of cells. A rule of thumb is this - select all the cells / rows you want to format but do not include column headers. Write the formula for the top-left cell. 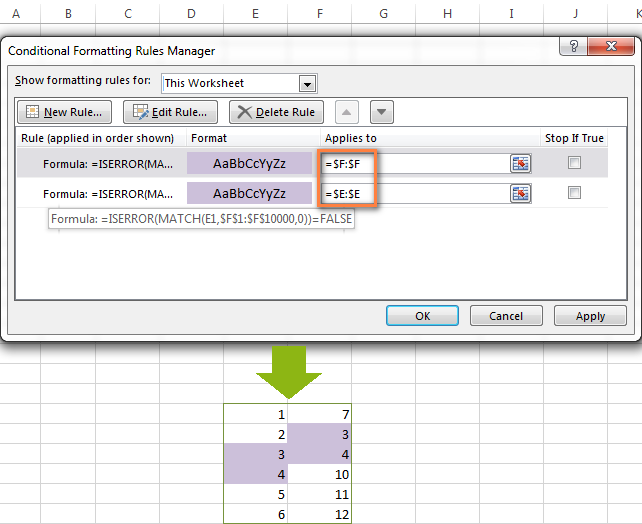 In conditional formatting rules, cell references are relative to the top-left most cell in the applied range. So, always write your conditional formatting formula for the 1st row with data. For example, if your data starts in row 2, you put =A$2=10 to highlight cells with values equal to 10 in all the rows. A common mistake is to always use a reference to the first row (e.g. =A$1=10). Please remember, you reference row 1 in the formula only if your table does not have headers and your data really starts in row 1. The most obvious indication of this case is when the rule is working, but formats values not in the rows it should. Check the rule you created. 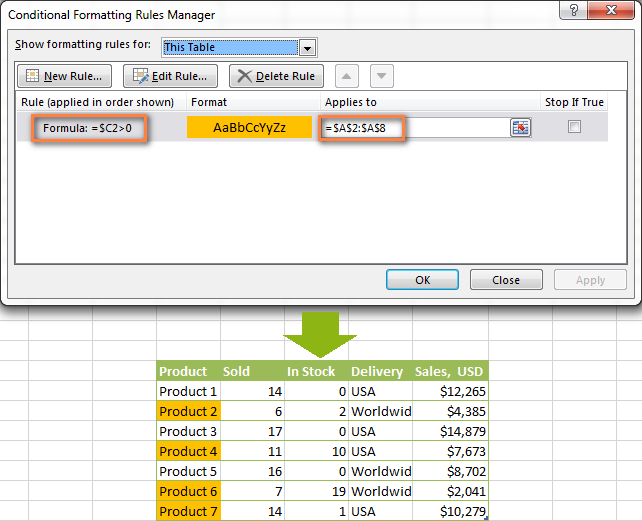 Double-check the rule in the Conditional Formatting Rules Manager. Sometimes, for no reason at all, Microsoft Excel distorts the rule you have just created. So, if the rule is not working, go to Conditional Formatting > Manage Rules and check both the formula and the range it applies to. If you have copied the formula from the web or some other external source, make sure the straight quotes are used. Adjust cell references when copying the rule. If you copy Excel conditional formatting using Format Painter, don't forget to adjust all cell references in the formula. Split complex formulas into simple elements. If you use a complex Excel formula that includes several different functions, split it into simple elements and verify each function individually. In my next article we are going to look into the capabilities of Excel conditional formatting for dates. See you next week and thanks for reading! 1,070 Responses to "Excel formulas for conditional formatting based on another cell value"
For newer editions you can use =IFS(A1=8;2;A1=10;4;A1=12;6) .. That would save you from nested IFs. But it requires 2016 or newer. =MIN(IF(A4:A9>4,A4:A9<6,B4:B9)) = 0 .This is the formula i cant get to work. as far I can see, you're trying to use IF function incorrectly. Please take a look at this article of ours to learn more about the syntax of the function. I didn't make my example ,clear. I have column "A" with these numbers 5 4 2 3 6 7 - In column "B" I have these numbers 30.92 31.29 31.11 31.17 31.29 31.07 If i select a number in column A or an adjacent number I want the minimum corresponding number in column "B" I need a formula for this. I tried this formula but all i get is zero.=MIN(IF(A4:A9>4,A4:A9<8,B4:B9)). i used control, shift, enter. I didn't make my example ,clear. I have column "A" with these numbers 5 4 2 3 6 7 - In column "B" I have these numbers 30.92 , 31.29 , 31.11 ,31.17, 31.29, 31.07 If i select a number in column A or an adjacent number I want the minimum corresponding number in column "B" I need a formula for this. I tried this formula but all i get is zero.=MIN(IF(A4:A9>4,A4:A9<8,B4:B9)). i used control, shift, enter.I added some commas between some of the numbers to make it clearer. Thank you very much for the clarification, Harold. I want to create a drop down menu that would carry out 5 rows of data. Hello I have a spreadsheet with 10,000 rows and 10 columns. Data starts in Row 2, Row 1 are headers. I want all of Row 2 to turn Red if the value in column G, row 2 is =1 then the whole row is Green. I then have to repeat this for the next 9,998 rows. Each row should look to it's own row's value in column G. But when I do conditional formatting in row 2 and drag down it will only look to G2 even if I'm in row 3,200 etc. I've tried $G2, and G2 but it will only look at the G2 no matter what row. In closing row 3543 needs to look at G3543's value to decide format. What am I missing? Thank you! I'm sorry my question is not coming over correct, 2nd try: I have a spreadsheet with 10,000 rows and 10 columns. Data starts in Row 2, Row 1 are headers. I want all of Row 2 to turn Red if the value in column G, row 2 is =1 then the whole row is Green. I then have to repeat this for the next 9,998 rows. In (Column D) I would like to sum the Invoice Amount(Column B) according to individual Customer(Column A) if due date is today or already past(Column C). Example: Today is "29th Aug 2017"
I have one issue,from a selected raw how I can highlight the whole column or selected portion if it identify a preset text or number? I have a issue that I need help with. Basically I have two sheets, one sheet that lists All Items and another that list the Items Sold from the all items sheet. I've used vlookup to pull all the relevant data from All Items for each item on the Items Sold Sheet. Now I want to highlight the SKU that appears in Items Sold in All Items. At the same time All items Sheet has more than one SKU whereas The Items sold has only one. I have used the below formula with Conditional Formatting on the All Items Sheet to try to accomplish this however it highlights all the Skus with a corresponding value from the SKU's column in Items Sold =COUNTIF(SKU, $B2)=1. I want it to highlight all the items sold but only one of the items. Can this be done? I am using few rules for conditional formatting for .csv file. But after the closing the file all rules get deleted. why this is happing? Can we apply this rules for .csv file. I'm sorry but there's no way to apply the formatting rule to the .csv file. It's impossible due to some peculiarities of this format. Please check this help page from Microsoft to see all the restrictions to the file. I desesperally need your precious help please: i have a worksheet with about 70 rows and 52 columns. Each row represents a store/client, the column represents the weekly quantity ordered. Most of the time the quantity doesnt change – except for certain periods. I need to see clearly when the number change. i though conditional formatting could help me but i cannot make it works. I need to compare all the cells to their adjacent cells. I tried the formula = B$3C$3, then i tried = $B3$C3, then without dollar signs … nothing worked (it highlight entire columns rather than cells). I need to automatically highlight the cell that is not equal to the cell to its right. Many many thanks in advance! I have a spreadsheet with 4 individual columns, then 15 column pairs. Each pair of columns is a set of data from two different sources, sorted by a common key value. What I need to do is highlight the value in the second column (of the pair) of a row that has inequal values. I know I can use, for example, =$E2$F2, applied to column $F:$F to highlight values in F that don't match corresponding value in E. But, how do I do this properly over 14 more pairs? Do I need 15 rules? But in the sheet there are some cells that identify as "C/R"
So the cell would have to be C in Blue / R in Purple. How would I create a conditional formatting rule based on the below formula. This formula is counting (then averaging in a separate, similar formula) worked hours but excludes login and logout times outside of the given range. I’d like to highlight the cells in another column (H:H) that meet the below criteria so that it’s easy to tell which times were actually used in calculating the final formula. For example. If 40 days were “worked” during the selected period, but only 34 days were used to create the result, I want to highlight those 34 cells. H:H=sum of hours worked (Logout-Login). What I wanted to achieve is cell formatting depending on the comparison of another two fields that have a date in them (one is a straight date, the other calculated date). If the month in those two dates matches (its equal) then to trigger the formatting (shading) of the third cell. But because this is not a valid formula it doesn't work. I have added this invalid formula here for making my question easier to understand. actually, your formula for is correct, if it doesn't work, most likely there's something wrong in your table or you apply the conditional formatting incorrectly. If you still require our assistance, please send us your workbook with the data and the result you expect to get to support@ablebits.com. Please don't worry if you have confidential information there, we never disclose the data we get from our customers and delete it as soon as the problem is resolved. Don't forget to include the link to this comment into your email. We'll look into your task and try to help. if col.1 and col.2 are empty and col.3 and col.4 have data and rest of columns are empty, fill with colour. 1. I have a spreadsheet that data starts at A19:AS100. I want to change font color to "red" for text VA only. In using conditional formatting, Format only cells that contain...I enter VA and have tried entering VA~ also to only change text for VA but it is also changing text color for VAC. Please let me know how I can change text color of VA only not everything that has VA in it or starts with VA.
2. In the same spreadsheet I am needing to get a total for the following "SUR,HSC,COS,HP" that are listed in cells beginning in column B19:AS100 by name. Names are located beginning A19:A100. There are times that the above list is entered in a cell with other text ex. HSC/CON, DP/SUR and I am needing it to count 1. When it is entered in a cell with two of the criteria listed above ex. SUR/HSC, HP/COS I still need it to count it as 1. I am needing it to count only once regardless if there are two of the criteria to count listed in a cell. I would truly appreciate any and all help you can give me on this. I have a problem that I need help with. I am trying to use Conditional Formatting to highlight one cell against another cell using greater than, equal to, and less than. The cell I want highlighted gets its value using a formula that gathers data from multiple areas in the spreadsheet. This seems to be the cause of my trouble. The cell I want to compare it to is a static number. For some reason no matter what I do I cannot get the cell containing the formula to highlight correctly. What I am looking for is when G3 is less than H3 then G3 gets highlighted red. When G3 is greater than H3 then G3 gets highlighted green. When they are equal G3 stays white. PLEASE HELP! I've spent 3 hours on this already. I have conditional formatting in a cell that turns red when it passes a certain date. In the cell next to it I have Status'. I want to shade the cell with the date in it when the cell next to it says "Completed" so I don't still think it's Red/past due. How would this work? Thank you in advance. I have a dates column AC2:AC37 and i also have a price column M2:M37. Once a date in the AC column has got to today date i want the matching price cell in column M to be highlighted. This will highlight only the prices that have today's date in column AC. I have an excel sheet where the county is listed in one column. I would like it to say "yes" in the column next to the County" column if the county is considered economically distressed. How do you write a formula to say "if this cell says Lake, Lauderdale, Haywood, Hardeman, McNairy, Perry, Wayne, Grundy, VanBuren, Bledsoe, Pickett, Scott, Campbell, Union, Claiborne, Hancock, Cocke, then the adjacent cell should say YES"? Would explain more about the part below that how the function works in order to ignore the 1st occurrences and not highlight it? To ignore the first occurrence and highlight only subsequent duplicate values, use this formula: =COUNTIF($A$2:$A2,$A2)>1"
I'm trying to format a cell on a separate sheet to be highlighted based on if multiple cells have at least a value of 1 in it. For example, I have 4 cells and each cell needs to to have at least a value of 1 for the cell on the other sheet to be highlighted. Can this be done? If so, how? Thanks. Hope it will help you! Is there any way for me to apply conditional formatting to a column that highlights only specific cells in that column that have blanks in the row that the cell is in? Such as highlighting cells only in column B where there are blanks in specific rows in column A. Where A1 is the top-most cell of the applied range. For example, if you are setting up a rule for B2:B100, then use the formula =$A2=""
I want to apply for AB23:AG23 from range O16:AH21... little help. For me to understand the problem better, please send me a small sample workbook with your source data and the result you expect to get to support@ablebits.com. Please don't worry if you have confidential information there, we never disclose the data we get from our customers and delete it as soon as the problem is resolved. Please also don't forget to include the link to this comment into your email. I'll look into your task and try to help. Need to colour based on other cell value like. If B2 value has a maximum valie in range of B1:B5 then only A2 cell colour with yellow. What formula i use in conditional formatting? I am trying to format cells that are a formula =(A1/B1) with percentage as a result in the C-column. I have tried both with Number, Percentage, Percentile and Formula. It works only when I have one cell that has become 100%, otherwise it will not show the right color. It is like the colours only works in relation to the highest amount put into the column? I do not always have the 100% but I still wish it to work according to the colors. Please help, I hope I have made this clear enough. i m trying t create an auto border with conditional formatting, since my cells are havign formulas, the border are getting displayed, even though the cells are empty. Thanks so much, This article was very much helpful. I would like to know the formula for the following. >>If Actual submit date is blank and overdue (due previous week) , Plan submission date highlight grey. >>If actual Submit date is blank and overdue this week, plan submission date highlight grey. >>If actual submit date not blank, no need to highlight. Hope you can help with this. thanks! I am creating a vehicle fleet inspection chart. Vehicles are required to be serviced within every six weeks. I have plotted a row of six weekly reference dates for the year based on the last service date from the previous year (E18:N18). Giving me ten dates. The dates in this row indicate that the vehicle must be serviced by each of these dates. > change to orange if a date is entered that was later than the reference cell. > change to green if a date is entered that is less than or equal to the reference cell. > no formatting for blank cells and stop if true. However, I still require the cells (E21:N21) to change to red if the cell is blank and the reference dates above (E18:N18) are less than todays date. This would show me that no service took place. How can I do this please? I am trying to apply conditional formatting based on the following and am getting very confused! The process should be, as each column has a value or date entered it changes to that corresponding colour, can you help? ...in other words, if there is "a tie at first place" in column I.
I know my formula for the conditional formatting has to include =AND($I1,)but I am at a loss as to how to describe my two conditions in the formula. ...in other words, if there is "a tie at first place" in column A, I want to make the cells in the NEXT column (column B)for those rows yellow. I know my formula for the conditional formatting has to include =AND($A1,)but I am at a loss as to how to describe my two conditions in the formula. Thank you for any help you can provide with this knotty problem! I was wondering if anyone could help me with a conditional formatting formula for the following information? I want to compare a 'Grade(1-9)' column with a 'Tgt' column and have it showing as red if it the 'Grade(1-9)' column is less than the 'Tgt'. Therefore, the 6A 6E and 6E in the 'Grade(1-9)' column I would like to highlight as red as it is less. Would the formula change for each different Tgt value or is there an one fits all formula? Thanks for any support or even just a no it wouldn't be possible! Sorry I forgot to mention that the 'Grade(1-9)' values start at cell E6 and 'Tgt' values start at B6. Column 2 Contains contains a (tick) which confirm if the shipment is sailed. I really appreciate you posting this tutorial Svetlana. It has made my work (and others here) a lot easier, keep up the great work! I will consider subscribing to Ablebits, you guys rock! I have some formatting set up so, if for example,I have cell B8 highlighted green with the letter "w" in it, any cell I put a W in will turn green as well. Where I am stuck is how do I get an adjacent cell to turn that same color without putting a "w" in it. For example. if I put a "w" in cell D8 and it turns green, how do I get cell D9 to turn green based on D8's value while leaving cell D8 blank? I think this will work. Select D9 then Conditional Formatting then New Rule then Use a formula to determine which cells to format then in the formula field enter =D8="W" then select the green formatting you'd like to see. I am looking for help on creating a conditional format where I am color coding a row based on a # the user inputs. These color codes (1 - 6) are used to indicate the order is in a particular status as they determine. Some cells on the row will already be highlighted in vbLavender. These are set by a different process to indicate something has changed with this data. I don't want the conditional formatting to cover this. So for example cell BB44 has the lavender background. Selection.FormatConditions.Add Type:=xlExpression, Formula1:="=$BT2 = 5"
So if in cell BT44 I enter a 5 the row is shaded blue. This also shades BB44 as blue. If I delete the 5 the lavender color is still there. How would I change the above to not color cells that have an existing color or vbLavender? VBA help is beyond the scope of this blog, but there are many sites where you can find VBA help. Just Google "VBA Format Conditions" and you will find them. I have two sheets in excel 2007, where I enter via barcode scanner serial numbers of devices, one sheet is for direct sales and the other sheet is for credit sales. I need a way to validate for duplicate s/n between two sheets. At this moment I am using the formula =COUNTIF(sheet1!d5:sj30000), like conditional formatting highlighting the duplicated cell. The system find duplicates very good, but becomes very, very slow. Now I want to validate at specific time, for example in the night, when the system is not used. Can you help me to setup time driven validation formula to trigger at specific time. You don't have to apply conditional formatting line by line. You can select all the cells that hold the calculation that you need formatted and apply the formatting to them all at once. 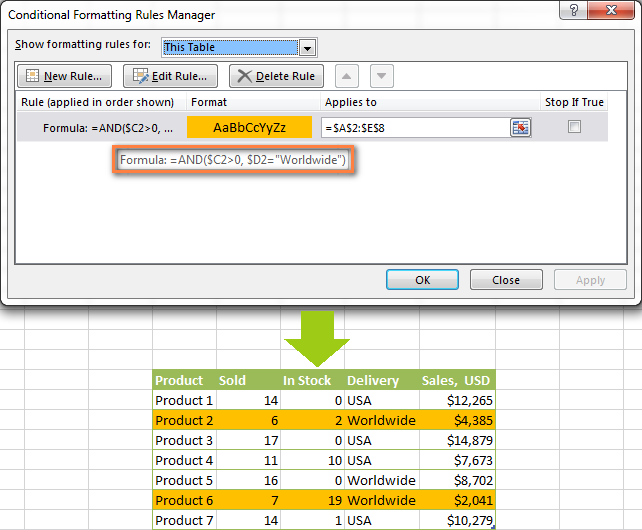 The conditional formatting rule is the formula. You can select all the cells in the column by clicking the column heading. I was hoping you can help create a formula/condition rule. I need an entire column “O” to return a value based off a digit I put in it a cell IN COLULMN O. Similarly in column Q- If I type “Y” in the cell, I want the cell to return a value of 65. For this I set a condition rule =If(Q1:Q25=“Y”,65,0) to be applied over Q1:Q25. Needless to say- it didn’t work! >0 selects a string containing and beginning with the specified word. Whereas, >1 selects the string only containing and not beginning with the specified word. Correct me if I misunderstood something. I am have an excel budget sheet with three important rows at the bottom. 1. a sum of each column. 2. a row with the copied value of the sum-value above to hava as a control. 3. a formula that subtract the above values (I would like this value to be zero as a control). To the first and third row I would like to have conditional formatting, coloring them red if they are not the right value (i.e: the 1st row to colour red if its not the same as thr 2nd row, and the 3rd row to colour red if its not zero). This contitional formatting only applied correct to three of my columns, and three colours red even if the values are correct. Please help!! Going nuts here :) Thanks! I have been trying to use AND formula in conditional formatting to change color of cell according to values but its not working. I Have a question regarding conditional formatting. I know how to apply a rule that if the value is under a certain amount, the cell value will equal this amount. I now want to apply a rule that if a cell is between a range, the value s equal to a certain formula. Example; if value is between 10000 and 20000, the result is 10000 plus 90% of the portion in excess to 10000. "Translating" what I'm trying to do is "I want TRUE when either the D column has the exact value 'TEXT 1' or has 'TEXT 2' written with not necessarily exact match"
The problem I'm facing here is that if I add the SEARCH function, it only matches the result of the SEARCH function. If I remove it, it matches the "TEXT 1" one. Am I missing something here? I'm a programmer and have to say Excel functions have a really terrible syntax. I'm sure it is a very simple issue, but I can't solve it. I have an Excel workbook with two sheets. I need to make column D in Sheet 2 format to fill the background a color if Sheet 1 has the exact same number in Column C. What is the function I type into Conditional Formatting New Rule on Sheet 2? Please and thank you! How can I use conditional formatting in a single column? For instance, using column A entering text in A1, then when text is entered in A2 and hit enter, A1 will have a strikethrough and A2 will not. Enter text in A3, A2 will strikethrough and A3 will not, so on and so forth. i hava two coloum in excel sheet A and B.
the value is different in both coloum. i need a conditional formatting formula to change color of col B when col A value is lower then col B. Where the value being tested is in B55. The "Out of Range" is needed to supply a display message if the value is above 50. Conditional Formatting Problem: I have made 8 Rules to color code certain words. 6 of the 8 Rules work great, but 2 do not. I have deleted the 2 Rules & reentered, but still no luck. HELP! During 37th week of 2018 [September], the first week of Hijri-1440 falls/starts. How to arrive at Hijri [Islamic] week number equivalent to Gregorian week number. Is there any formula in this regard? How can I use Conditional Formatting, when valve change in A1, B1 change the color. I'm trying to create a rule in which If the Column starts with the number "13", to then make all numbers in the adjacent row negative. Is there such a way to do this? I was wondering if you'd be able to help me. I am trying to use a conditional formatting for two criteria, anything that has tomorrow's date and is a duplicate. My spreadsheet has other days from October, but since tomorrow is October 11th, I want the conditional formatting to show me any duplicate numbers for October 11th only and highlight those duplicates for October 11th. I appreciate any help you can offer me! I have a spreadsheet I'm writing for a complaints database. Responses are meant to be issued within 10 working days. this works in as much as it highlights the row, but it highlights it whether or not J3 is blank. I have fiddled with the absolute references but that just results in nothing being highlighted at all, even when it should be. Please could someone explain to me what the () after today, and the after J3 do to affect the formula, and how I can manipulate it to highlight only if both conditions are met? What is also bizarre is that I have rewritten this formula from scratch within the formula box (at the same position in the rules order), and it doesn't do anything, even if both conditions are met. I feel like my version of excel is a bit temperamental and does whatever it feels like! I can take screenshots to show what I mean if that's helpful. I want conditional formatting to apply in the following instance. hi i have some sales value and contribution % of sales value and i want to highlight those articles which are contributing 80% of my total sales value how can i do it? Thank you very much for the help in the topic "Excel formulas to work with text values"
I urgently need help to calculate and "bonus" on a commission structure. If the SUM of A1+B2 = between 1 & 9, then A1 needs to be multiplied by a certain % however if the SUM of A1 + B2 = between 10 & 19, then A1 needs to be multiplied by a different % and so on. I have a sliding scale of 6 percentages. I have three columns, ID, Date and Code. I want to highlight the rows that have the ID and Date the same and the Code on that date is only T. If on the same date there is a code that is T and T, I do want to highlight it. If on the same date there is a code that is C and T, I do want to highlight it. Thank you. I really appreciate your site and clear layouts. Can you come to my rescue please. I would like A3.6 to be highlighted as it is the lowest value. I've experimented because there is both text and number in the same col but no luck. How do I automatically offset cell values between columns? I have 2 columns, A and B. Column A should always be less than Column B. Can you please help me out? I have two columns with the conditional format of one cell based on the cell further along the row. I would like to know if they are less equal to or more than. I can do this for one cell. However, when I copy and it down it still references the original cell. How do I make it so that it changes the reference cell? I am trying to format a cell to say PASS & also format the cell to change colour to green based on this answer. The cell I am trying to format has to read multiple text values based in a different row any ideas how to go about this or help would be greatly appreciated. I wanted to know if I could use conditional formatting based on a predefined table in excel. The conditional formatting should be able to identify the text in that table, find the text in the defined sheet, and format it to a specific color based on the table's formatting. I am trying to highlight cell F21 if the amount in this cell is greater or less than 0.02 of the amount in cell B21. Can you help? I am using excel 2007, I'm trying to use conditional formatting using the below formula. Basically, I want to highlight column A if the other column has negative values.But is not working. It worked on excel 2016. Appreciate your help for any suggestion. How to use If(isblank) formula when the cell i am linking has an existing formula? The result is always #value since the excel reads it not blank although the value is zero or blank since it has an existing formula. Anyone who can understand this situation? =). You're response will be so much appreciated! Thanks. so lets say i need a patient to get a test on a specific date prior to the date in B1 06/08/2019. the date of test cell D1 is formulated (=B1-7*20) then in cell E1 has “done” typed cell D1 turns green. But if the date in cell D1 has passed and “done” is not typed in E1 then the cell turns red. I am just having a heck of a time because the conditional formatting doesn’t recognize the formula in D1 as a date thus it wont change.